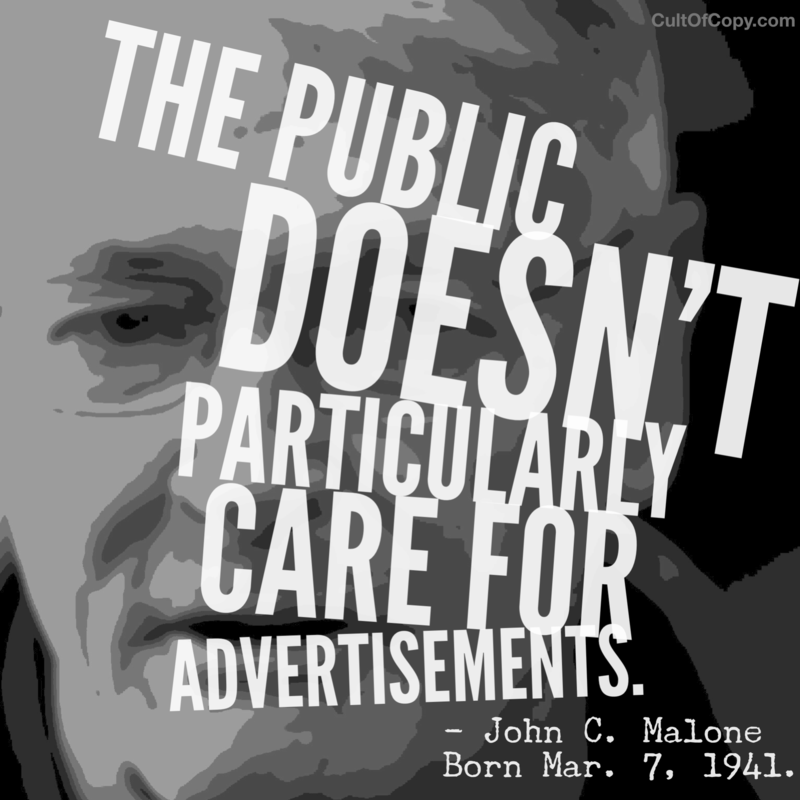 “The public doesn't particularly care for advertisements.” – John C. Malone, Born Mar. 7, 1941. They don't. It's true. Unless it's the Super Bowl, normal people don't really want to be subjected to ads. For some marketers, they try to solve this problem by having a certain ratio of content to ads. 22 minutes of show for 8 minutes of ads. Five content emails for every one promotional one. For me, it's just a lot easier if you create content in such a way that the reader doesn't realize it's an ad. Stealth-like. 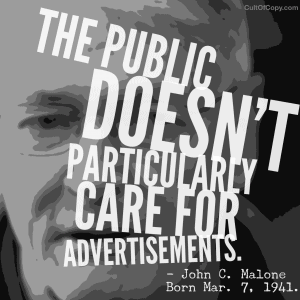 Everything you publish is an ad. Even if all the readers are spending is attention, you should have the goal of leaving them with something valuable for what they paid. Even if it's just a chuckle. Chuckles are endorphins. Endorphins are addicting. But you can do more than that. Think about what you sell. Think about the problems those products and services will solve. Start and advance conversations about those issues and concerns. Symptoms. Causes. Side effects. Complications. Give them the fuel to make their own problems more complex, threatening, and urgent. You don't have to yell or push. Just discuss. Share. Educate. That's it. People don't care for ads. But they love reading and griping about their problems. The online expression of these exchanges happens to be very fertile soil to plant seeds, which you can later harvest as crops of cash. But look around you. Here. Other “places” you visit online. Shows you like on TV. Publications you subscribe to. Do you see it? The kind of content I am describing is the kind of thing your prospects post and read and share among themselves WITHOUT you being there. Which you, of course, just happen to sell. And they'll be happy to buy it despite believing that they've never seen a single ad for it.